OAKLAND, Calif. - At a recent Occupy march here against police brutality, demonstrators stopped several times along their route to decide which way to go. At one intersection, it took about 10 minutes of deliberations before the group decided to head through a residential neighborhood. The Occupy movement in some ways looks a lot like that meandering Oakland march. Six weeks after the first protesters planted their flag in New York, Occupy movements across the country are still without a set of demands, an agenda or even a plan for what to do next. The protesters are the first to admit they're charging ahead without a specific destination in mind. Some worry about the lack of definite goals. But others protesters argue it's too soon to define a young movement with such a diverse group of protesters. Their lack of a cohesive agenda has raised questions about the fate of the Occupy movement -- especially as temperatures drop, and police attempt to clear away the tent cities. But in interviews with Occupy members around the country, several said that they're confident the momentum they have already gained -- in part from police crackdowns -- will pull them through. They say they will figure out the rest. "We can't lose. We're too big to fail," said Shon Kae, an Occupy Oakland organizer. Either way, for now, the occupiers aren't moving. Across the country, police crackdowns have only fueled the Occupy movement, attracting new participants and generating major publicity for the protesters. In Oakland last week, several thousand marched through the streets the day after police raided two camps and later clashed with protesters amid clouds of tear gas. At least one protester, Marine veteran Scott Olsen, was seriously injured during that incident. The image of him being carried bleeding through the streets became a rallying point for the movement. Lawmaker: Oakland police overreacted to "Occupy"
Olsen was upgraded from critical to fair condition late last week. Keith Shannon, a friend who served in Iraq alongside Olsen, said on Tuesday that supporters would not be providing the media with updates on his condition for the next several days. The backlash from the violent images of police clashing with protesters amid clouds of teargas was immediate. Oakland Mayor Jean Quan's legal adviser said he briefly considered resigning over the incident. Protesters demanded her recall and booed her offstage when she tried to speak to them in person. Quan apologized to the protesters via a video message on Facebook and said they could return to the grassy square outside her city hall office. Just please don't camp overnight, she requested. The group promptly set up dozens of tents. And a kitchen. And a medical tent. And a children's play area. And an acupuncture station. Police have kept their distance. In Denver, where police used pepper spray and mace in a confrontation with occupiers over the weekend, protester Jeannie Hartley said the incident has drawn more protesters into the streets. "I've had people come up to me," Hartley said. "A woman who saw the clashes on TV Saturday afternoon came down with her husband and her children." After Nashville protesters were arrested by state troopers two nights in a row last week, "people of all stripes have come out of the woodwork in support," said Buck Gorrell of Occupy Nashville. Gorrell said city council members have lent their support to the movement and live streams of the group's general assembly meetings have been "huge." On a recent night, 4,000 were watching the protests online in anticipation of a police crackdown, he said. On Monday, a federal judge granted a temporary restraining order requested by the ACLU on behalf of the Nashville protesters, blocking the state from continuing the arrests. Both Denver and Nashville have carried on with their "occupations." Among the demands: legislation to stop foreclosures, an end to police brutality and political corruption, a halt to Medicare and social-security cuts, better access to medical care, a utopia-like world in which prisons do not exist. In Portland, Ore., protester Matt Denney, a 24-year-old nonprofit worker, said his group is divided on whether to set goals or continue without them. "I think you could see it split into different camps," he said of the Portland movement. In Occupy Denver, Gettleman said that's not a problem. "I personally believe that it is way too early to state what the end goal of this movement is," he said. The movement lacks any real structure, such as officers or a voting hierarchy. Protesters decide everything by consensus, sometimes with hundreds or thousands of people present. That makes the decision-making process unwieldy even for minor issues, such as moving tents. Reaching a consensus on a list of goals -- or whether to set goals -- would be even more complicated. For now, the protesters are preparing to tackle a big new question: money. 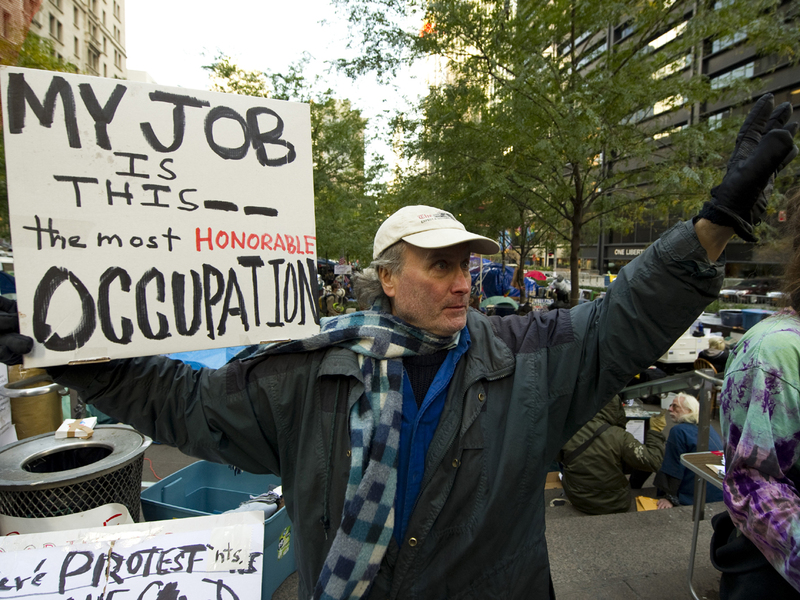 New York's Occupy movement has received $500,000 in donations. But since they don't exist, according to the Internal Revenue Service, it's difficult to figure out what to do with it. Recently, Occupy Oakland received $20,000, donated by their New York counterparts. When asked what they'd do with the money, Oakland protester Kae, laughed. "We haven't decided how to receive it," he said, explaining that the group has no treasurer and no infrastructure in place to handle money. He added: "I think that's going to be a very long conversation with a lot of people."